Today marks 2 months in a row of me posting a monthly income report for our blogs, so I guess that’s kinda neat. We had another record month in January. Lesson learned is that it’s easier to talk about how things are going when they’re going well… who would have thought? Anyway, this report is going to be short and sweet. I have a bunch of other stuff I SHOULD be working on right now, but I promised an income report in our Facebook group last week, so I am gonna stick to that. Doing last month’s income report in Q&A format seemed to be a hit, so I’m going to stick to something similar for this one. I went on a little bit of rant last time about how I’m sick of seeing the same copy and pasted income reports each month. I really want to add as much value as I can to these reports, besides just slinging Bluehost (or in our case, Hostgator) links at you. (But hey, if these reports inspire you to actually start your blog, we would be super grateful if you used our Hostgator affiliate link. As an added bonus, you will get a free copy of our Pinterest traffic course ($47) if you email me a copy of your purchase receipt. Here’s a full blog setup tutorial to guide you along). P.S. As I was brainstorming titles for this post, Ben had a good suggestion: “How I Made $12,372 Blogging This Month with Just 387 Hours of Work.” lol. Not sure how that would do for click through rate, but keep an eye out for that pin on a Smartfeed near you. As you might already know, Ben and I run 3 blogs. I will be the first one to admit, Pinterest is getting harder and harder by the day. It’s still a goldmine for free traffic, but it’s definitely NOT what it used to be (for us, at least). And I think it’s only going to get harder from here. Just look at what’s happened with Facebook over the years… that’s probably going to happen to Pinterest, too. With that in mind, our priority for DollarSprout over the next few months is going to be on SEO. More on that later. Even though January was the best income month our business has ever had, the traffic woes were a bit of a downer. Persistence really does pay off. If you are in our Facebook group, you’ve likely heard about our Blogging Resource Giveaway by now. This has been Ben’s project for the past couple of weeks. Basically, we are giving away free blog stuff every Friday for the next 38 weeks (or something ridiculous like that). Ben has been busy contacting bloggers and course creators, and as of right now we have over $5,000 worth of online resources to give away to you guys. Pretty cool, eh? Obviously, the goal for us here is to increase our email subscriber list and grow our Facebook group. It turns out that helping promote OTHER bloggers (and their products) is a decent way to get that done. Value exchanged for value. As I said before, the days of easy Pinterest traffic are numbered. As such, Ben and I have been super focused on diversifying our traffic sources with DollarSprout. Link building. Nothing spammy or sleazy. We’ve just been hustling like crazy to get our name out there. We spent about $1,400 on Facebook ads in January for DollarSprout. The Facebook page now has just over 5,000 fans, which we are happy with. Since our Pinterest account has so few followers, we wanted to have at least one social media account that we could point sponsors to and say “hey, we aren’t completely clueless.” Even if it’s a vanity metric to an extent, it still matters to potential sponsors. The good news is that our 5,000 likes are extremely targeted (thanks to Ben’s FB ads wizardry), so our page actually gets really awesome engagement compared to other pages of a similar size. Moving forward, though, Ben and I have decided to shuffle around our spending a bit. We want to allocate more towards SEO, and the reason is pretty simple: it’s a way better long-term return. Now, when I say “spend on SEO,” I do NOT mean directly paying for link placements. That’s against Google’s rules, and we do not want to risk anything with that. This article from Authority Hacker does a great job of explaining what I am *trying* to accomplish. Having a handful of highly converting DollarSprout articles rank on Page 1 of Google is worth hundreds of thousands of dollars over the lifetime of the blog. Building a system to make THAT happen is a lot more important than getting DollarSprout to 10k or 100k fans on Facebook. I don’t have anything valuable to share here. I just know we spent a few days on this and it sucked haha. Accountants are worth every penny. This was the other big focus for me and Ben in January. Stay tuned. Like I said before, last month’s Q&A format seemed to be well received, so we are going to do it again. The questions below are from people in our blogging group on Facebook (which you 100% need to join, if you haven’t already). What is your Facebook ads strategy? How many ads are you running and to what articles? Ben can probably write a book on this! (He’s the man in charge of running our ads — I pretty much stay out of it). Since we are shifting our focus away from Facebook ads for the time being, I’ll just hit the highlights. This was broken up between 15 or so different ads, which means that some performed better than others. Our basic philosophy is this: If we can get someone to visit an article for 4 cents, but make 3 cents back from a well monetized article, we are basically growing our Facebook page at a 75% discount. So, roughly speaking, we gained about 2,000 new likes in January while recouping about 75%-ish of our ad spend ($1,378). That means we effectively “paid” $344 for 2,ooo targeted page likes. Not bad. Big takeaway here is that it’s really important, especially when running Facebook ads, to understand your average revenue per pageview on a specific article (you can accomplish this via affiliate sub ID tracking, which I discuss in this income report). Note: I understand it may seem “inhumane” to look at pageviews with such a commoditized perspective. The truth is, you can deeply care about your readers while at the same putting together very structured data about them. The two are not mutually exclusive. What are your highest converting offers? Our highest converting affiliate offers in the personal finance niche are the ones with the lowest barriers to entry (meaning, we don’t try to sell big ticket items). For us, that often means promoting affiliates that are just looking for lead generation (like an email optin) or some other very small action. How well does your Google traffic do for affiliate conversions? Much better than Pinterest or Facebook. It’s not even close. People coming to your site via search engines have what’s called “search intent.” That means they are actively looking for the exact content that is on your blog. They didn’t just stumble across a pin or a Facebook post that caught their eye. They aren’t passive readers vegging out on the couch. They want what you’ve got. Without crunching all the numbers from our different affiliates/articles/traffic sources (takes too long), I would reasonably estimate that Google traffic converts at least twice as well, if not more. There is a reason that advertising with Google AdWords is so expensive, even though Facebook’s demographic targeting capabilities are so much better — it’s all about search intent. Where does the majority of your blog income come from? You can dig around some of our other income reports to find the exact affiliates (or just look at our websites haha), but chances are, your blog and your audience will demand something much different than ours. So there is really not much use in me hashing out each individual affiliate here. What is the best way to monetize your blog besides Amazon affiliate links? We do almost zero Amazon stuff! 4% commission is tough to make a living off of, for us at least. I know a lot of people are crushing it with Amazon, but that is not us. First, learn how to write content people want to read (sounds easy, but it’s not). Learn the skill of building traffic. 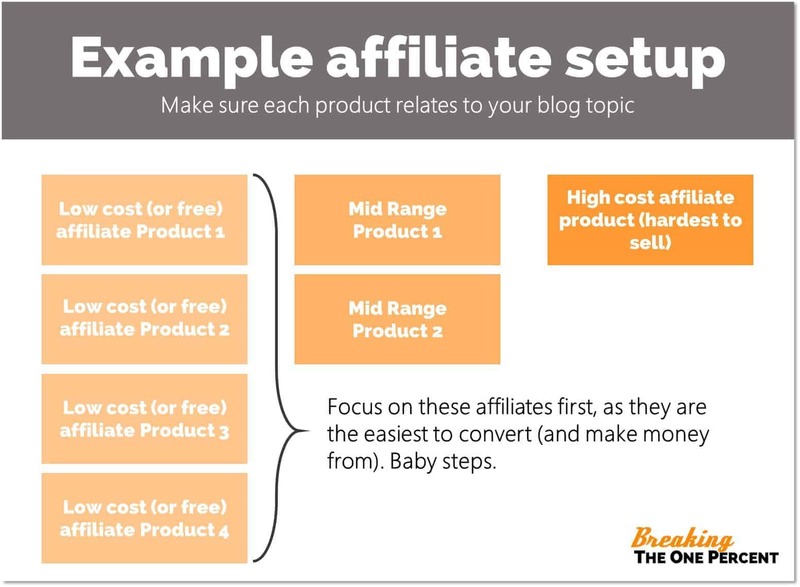 Start with low threshold affiliate marketing, as described earlier. Experiment with promoting bigger ticket affiliate offers. My blueprint post goes into way more detail on all of this. Do you base a post off of an affiliate you want to target or is it based on a topic and then you find affiliates to use? Good question! We actually do both. Here’s an example where it’s all centered around one particular affiliate, and here is one centered around a topic which we then find affiliates around. Generally speaking, the latter performs better. I think it’s because a reader can pick and choose between options that they feel benefit them the most (rather than having to sell them on one exact affiliate). What is your traffic breakdown (Search vs. Social) for each site? What is the point of me sharing all this stuff? For people who follow us that are already bloggers, I hope you can actually learn something useful from what we are doing and take it and apply it to your own blog. Me and Ben definitely don’t have all the answers, but we’ve learned a good bit of stuff worth sharing along the way. More than anything else, I want this monthly income report to inspire you. This blogging thing is real. In the last 60 days, we have made over $24,000 online (revenue), which still feels insane to me. I kinda can’t believe it’s actually happening, to be honest. We spent a lot of months at $0 income, and there was a long time where I doubted if we could ever make it work. At the same time, there is a massive amount of work that goes into this, and I hope that these types of post help get that point across. That’s the funny thing about blogging – it’s so easy for anyone to get started. The hard part comes once you have everything set up! I wrote this post in a cafe on a Monday morning (when everyone else in town was driving to a job they dread). The rest of the day was spent learning and hanging out with other bloggers. It’s about 7pm now. I just checked in on our different affiliate dashboards and I see that we’ve already made over $250 today. I haven’t had to answer to a boss, I get to work on something that *I* want to work on, and I have complete freedom to choose when I work. ….and starting is the most important step. If you’ve made it this far and don’t have a blog, what the heck are you doing?! Just start the darn thing! Then wake up in 1-3 years with a completely different life than the one you have today. This is amazing income to earn from blogging. Most average people would live a great life with this type of income. And I know a lot of it is passive! I love blogging for this reason. The power of building passive income. Income that can come every month with just a few hours of work. It’s amazing the power of the internet and information. Thank you so much for sharing this income report. It really helps to really believe in the power of blogging and affiliate marketing. I appreciate the transparency! You + Ben are so eloquent! After watching + reading how you two look at Facebook ad spend, I want to dip my toes into Facebook advertising on my own blog. I’ve been very casual about understanding my revenue per page view, but this is one thing (out of MANY) I’ll definitely take away from BTOP in 2018. Thank you for always grinding, always inspiring, + always teaching! Woohoo! Which tidbit was it that stuck out to you?